There are times when you really need to look at a calendar. You could open iCal, but that seems like overkill. 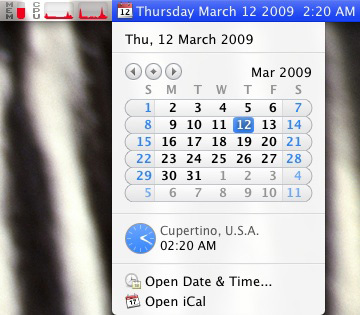 One option is to download an application that can add a calendar to your menu bar. There’s plenty of options for adding this feature to your Mac. Some are very simple and just offer a calendar, while others come as part of more complex packages. For example, if you’re the kind of person who likes to feel they know what’s happening on their system, you can download a free app called iStat Menus. 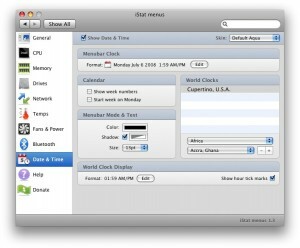 This app actually adds itself to your System Preferences menu, and allows you to add little system monitors up in your menu bar, along with a heavily customizable calendar and date display. 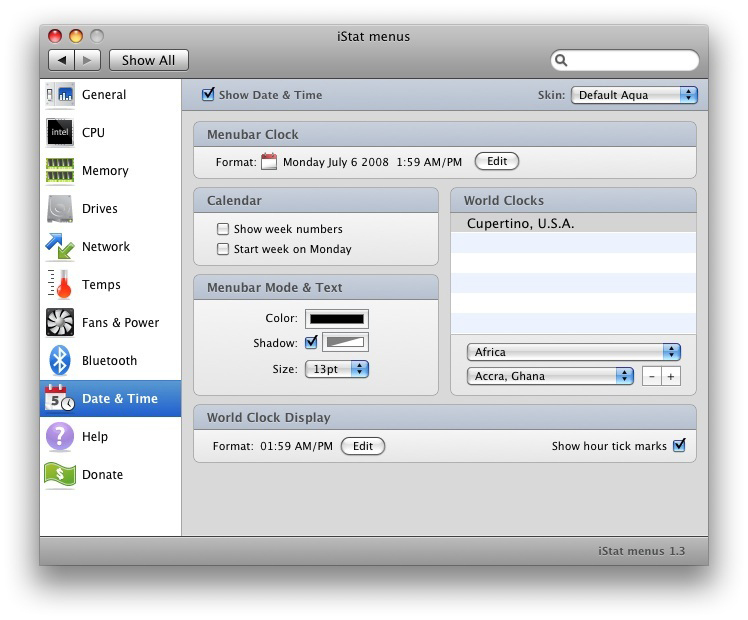 The calendar, date, time, memory meter, and meters for both CPUs in iStat Menus. Another popular option is MenuCalendarClock. With this application, if you pay to register (or get it as part of a discount bundle) you can also view your iCal entries in the drop-down calendar without having to open iCal itself. If you use Google Calendar instead, you may want to check out TinyCal. One more option of interest is Eigenclock, which is simple to localize if you’re a non-English speaker and is another free option. Dee-Ann LeBlanc (www.freelancesurvivor.com) has been a computer geek since childhood and a computer writer for the last 15 years. Her home is run by Macs, Linux boxes, and a trio of dogs.